Life is full of joy… and prejoy. 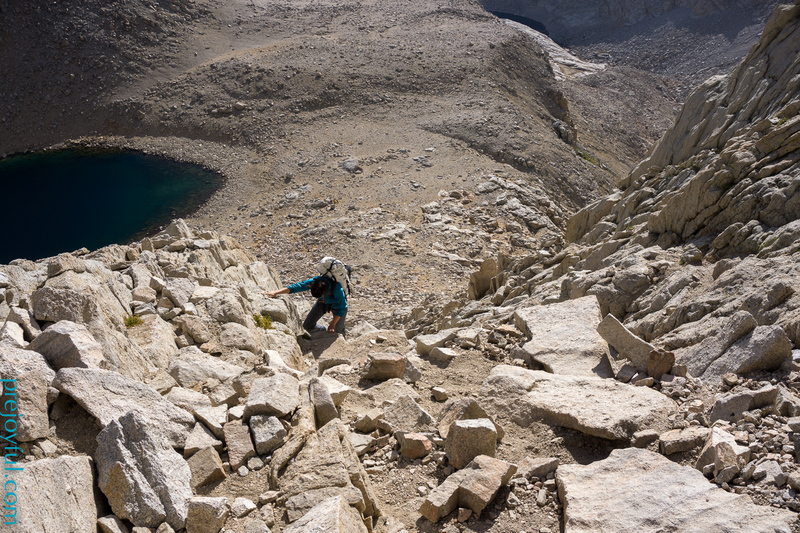 After retreating from smoke on our Sierra High Route bid, we still wanted to experience the highest part of our intended itinerary. 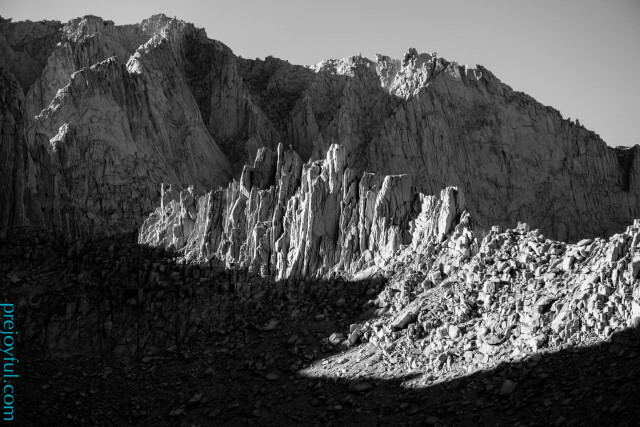 Our plan was to avoid the smoke by returning to our home, The Fire Truck, parked in Lone Pine, then drive up to Cottonwood Lakes Trailhead and piece together a loop that included the last few passes of our route, and Mt. Whitney. 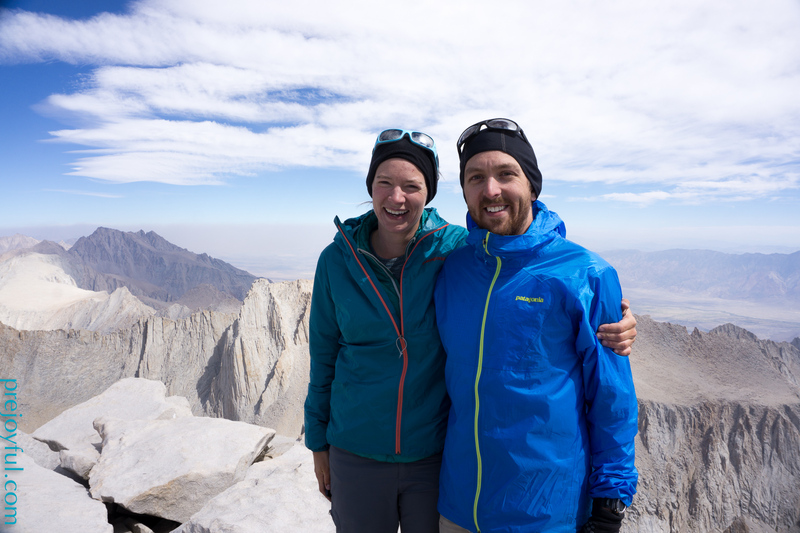 This plan was foiled by a stomach virus that kept me off my feet for a day, leaving us only time to go up Whitney before our permit expired in the first few days of September. In good form, we went for the Mountaineer’s Route, as our original itinerary planned. How hard could it be compared to the passes we had completed? We assumed we would be in good company on this popular mountain. We camped at the Whitney Portal trailhead late the night before our start. We dallied and started up the trail mid-morning, intending to only go to Upper Boyscout Lake. The elevation gain was significant, but the mileage was low. The first section on the standard trail went quickly, and soon we headed up the North Fork trail. Annie near the top of Ebersbacher Ledges. 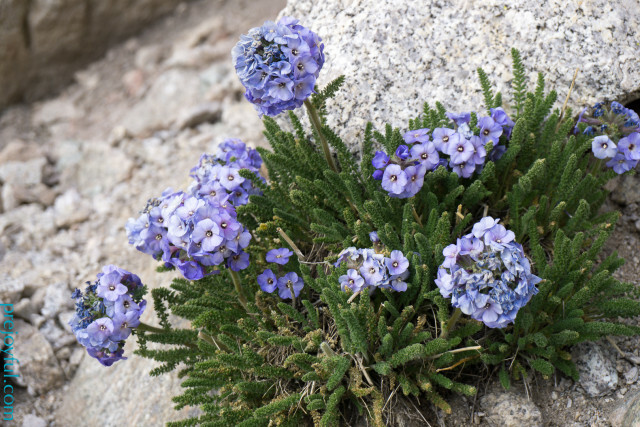 We had done significant research regarding the Mountaineers Route to the summit from Iceberg lake, but had done no reading about the trail from Whitney Portal since it was never part of our plan. The trail itself was easy to follow, but we were surprised to find ourselves at the bottom of a series of exposed ledges, which turned out to have a name: the Ebersbacher Ledges. Not knowing if we were on route, Joffrey explored ahead. When he was sure that we were still on trail, he helped me navigate the parts that made me most nervous. As always, it was not nearly as precipitous as it seemed initially. Above the ledges, we cruised some less exposed trail walking, before reaching Upper Boyscout Lake in the early afternoon. We lunched at the water’s edge watching a huge number of fish jumping and napped in the sun. After our nap, it was still early, so we continued to Iceberg Lake. There were so many tents set up at Upper Boyscout that we thought we might be happier closer to our route start and with more privacy. The trail up to Iceberg was not challenging, but a bit gnarly and unclear at points. Despite being relatively well acclimatized, I felt the effects of altitude in the form of nausea as we climbed up the last ledges just below the lake. We arrived after 3pm, set up our tent (our YAMA tarp continued to perform well, even on hardpack, rocky, alpine terrain in gusty winds), and ate dinner before 5pm. As we ate, we were able to watch four different groups of climbers pick their way down the route that we would be ascending. There was variation in their choices of line, but some similarities. This definitely helped us choose a line (climbers often follow a clear snow pack, but there was none this late in a dry season), and mentally prepare for the next day. The alpine wind was chilling, so we crawled into our sleeping bags for an early sleep. We started at sunrise the next morning. I felt a little sick, perhaps due to the altitude or nerves, but that quickly dissipated as we began the climb. Adrenaline and physical exertion can move your mind away from most discomfort. Mt. Whitney Massif in first light. There were three distinct sections to the route in our minds. The first section of the route was a series of steep ledges leading from the lake to the gully below the East Buttress. The second section was the scree filled gully that runs up to the “notch”. The third was the final third class climb up to the summit plateau. Annie ascends steep terrain in the first section of the route. The first section looked intimidating from the lake, but had good ledges to follow despite the exposure. Joffrey had a good sense of the line he wanted to try, and I generally followed him. I took some different direction when he discovered looser rock than he expected, or when I felt more comfortable on a route that I was eyeing. We stayed together, watched each other’s lines to avoid rock fall hitting the other, and ascended the ledges much more efficiently that we expected. 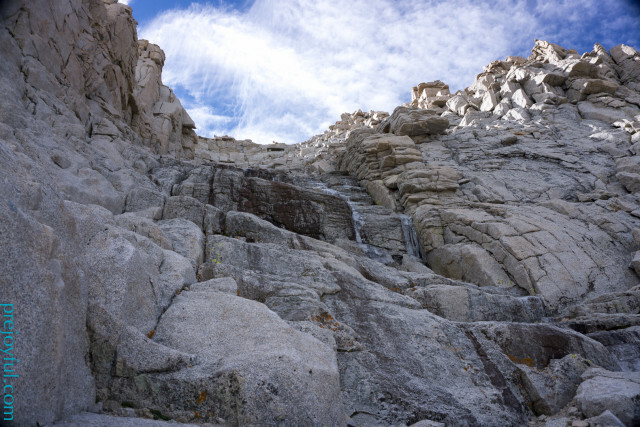 The gully felt significantly less exposed, with rock walls on both sides, but it was filled with deep, very loose scree. There were a number of use paths that switch-backed up the gully. We followed very different routes, with Joffrey hugging the walls and I picking my way through different steps. Both seemed equally treacherous, but also reasonable. Finally we arrived at the notch, still earlier than we had expected. The gully with Mt. 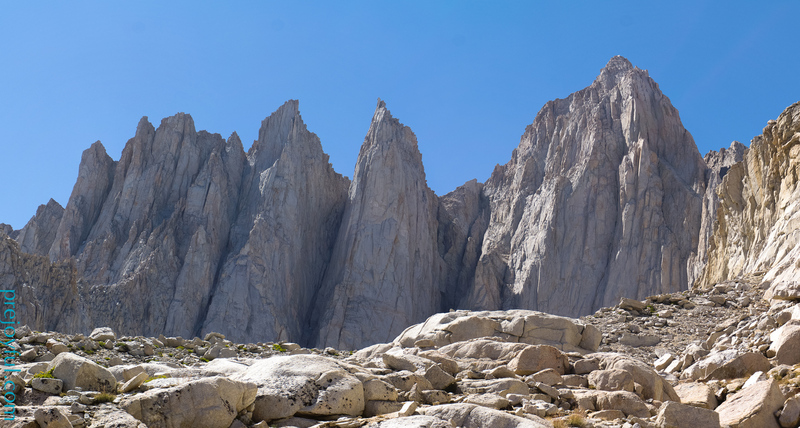 Whitney’s East Buttress rising on the left. 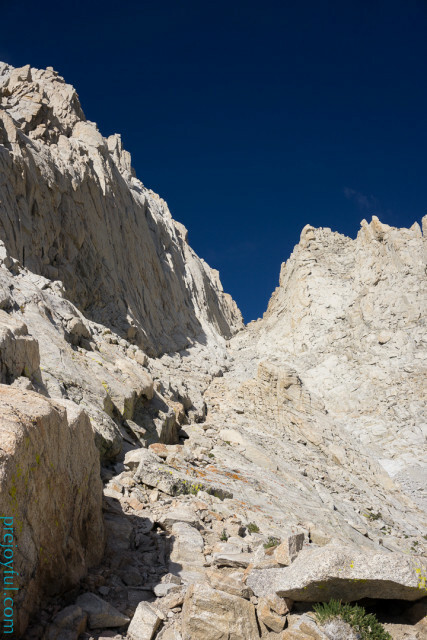 I had been dreading this transition to the last section since we began reading about this climb, but I also had not gotten the sense that the approach would be as much third-class climbing as it ended up being. I was feeling committed. I had a small freakout, ate a fruit bar, and then felt more assured when I realized that the last segment looked like much more solid and secure rock, at least from the bottom. 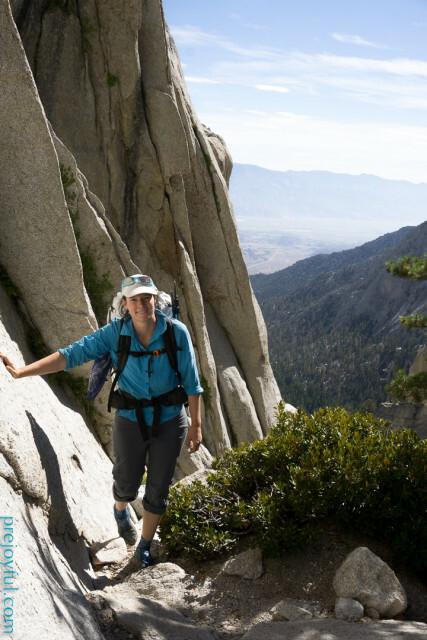 There were some more committing moves to do – more vertical climbing where you had to plan out your foot and hand placements carefully, but for a while the rock felt a lot more comfortable to me than loose scree. Of course, what would a Mountaineer’s Route be without ice? Joffrey and I luxuriated on the summit for an hour and a half. We ate. We took pictures. We ate more. We gawked at the perfect views. We signed the guest log. We watched the crowds of arriving people slowly increase. Pure joy. The view north. Note the dense smoke in the distance. As planned, we followed the standard Mt. Whitney Trail down. We passed many people who were already headed down, and we passed many, many more people going up. 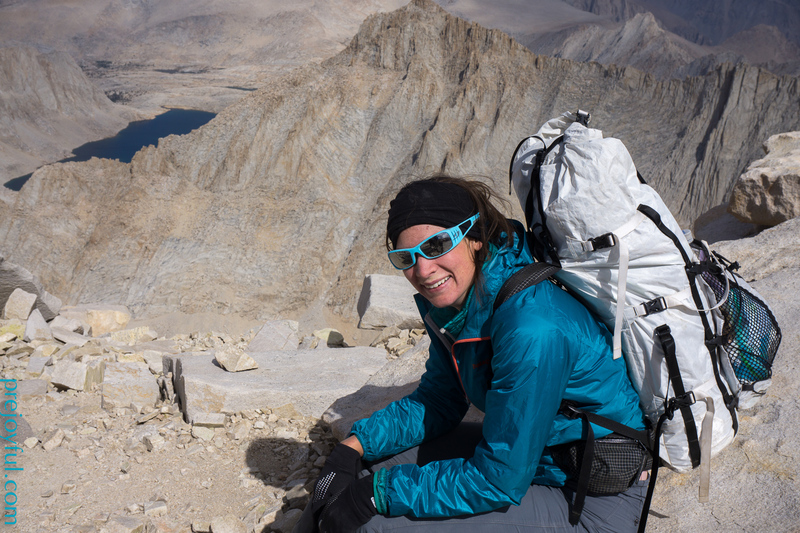 We were impressed at the various experience levels and fitness levels were were seeing heading up the tallest peak in the continental US. The views were beautiful, the trail was a feat of engineering (although Joffrey fiercely hates switchbacks), and we enjoyed it for different reasons than we enjoyed the Mountaineer’s Route. I was happy to feel completely secure in my footing, and let my brain rest despite the continued exhaustion that I had to overcome to finish the 11 miles down to the Portal. We arrived in the early evening, and drove into Lone Pine to finish the day with espresso milkshakes at the Lone Pine Bistro. Night sky above Mt. Whitney. Did you avoid the use trail switchbacks up the mountaineer’s route purely because of Joffrey’s hatred for them or was the more direct route easier? 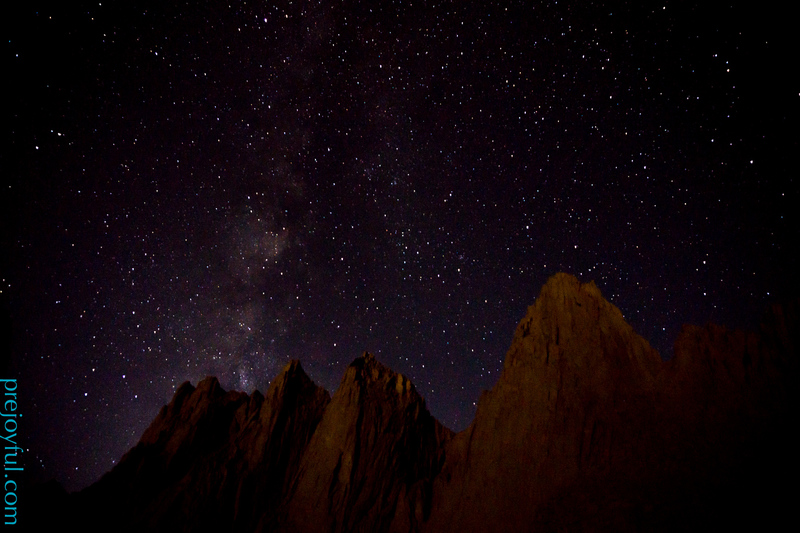 What settings did you use for the night sky above Mt Whitney photo? Dave, the Mountaineer’s Route is part of the SoSHR, but cutting off lots of unnecessarily low grade switchbacks was a bonus! Settings were: f=16 mm, A=f/4.0, S=10 S, ISO=2000. I think the settings on all of the photos should be viewable on Flickr, except perhaps for panoramas with blended settings. Were the mountains lit up only by starlight or was there another source? I would guess the moon but then I wouldn’t expect the stars to be quite so outstanding. Astute! The moon had just risen and was lighting up the mountains. If I had a better lens/sensor, I probably could have gotten an even better shot, but I’m pretty pleased given that I was standing, shivering in the cold wind after I got up to pee in the middle of the night, and my tripod is 10 inches high and weighs 3oz!